Think you can beat me and The F.A.N. Show in a fantasy league? Well now you may have that chance! I will list below exactly how to sign up, then finish this baby up with league details and THE PRIZE! Now first, you have to make a free account here at FlurrySports. This will give you the ability to earn reputation points as you talk fantasy and other sports in this section of the site, and it will also allow you to receive monthly newsletters with big news, promotions, etc., so it’s something you’d want to do anyways. Second, make sure you’re following the FlurrySports Twitter and The F.A.N. Show’s Twitter! Finally, comment on this thread your favorite fantasy football team name! Don’t be lame and copy someone before you, that’s no way to earn a spot! If you need inspiration, we did an article on some of the best team names here. 14 people will be selected on August 20th, so you have a little over a week to get signed up and let all your friends know to sign up! Now, I did say 14 people will be picked. 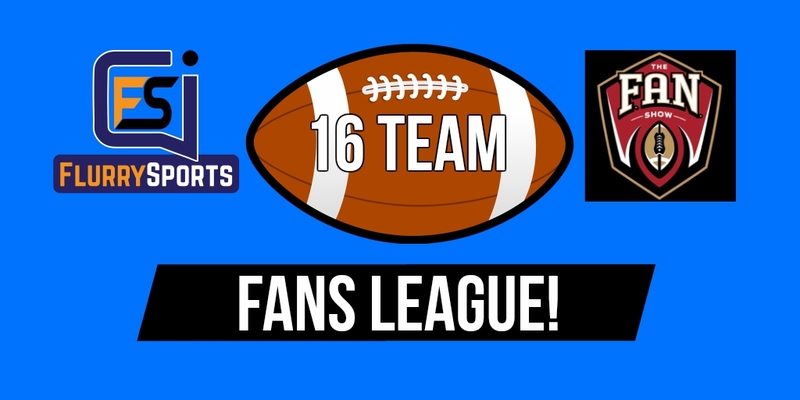 This means the Fans League will be a 16-team PPR league competing for a FantasyJocks Championship Belt! There’s a lot on the line here…think you can beat me?